My name is Mark Scott and I am of an age that means I remember fondue sets and high waister trousers….. I am originally from London, but now live in Kent with my family, wife Alison and son Cameron (7). 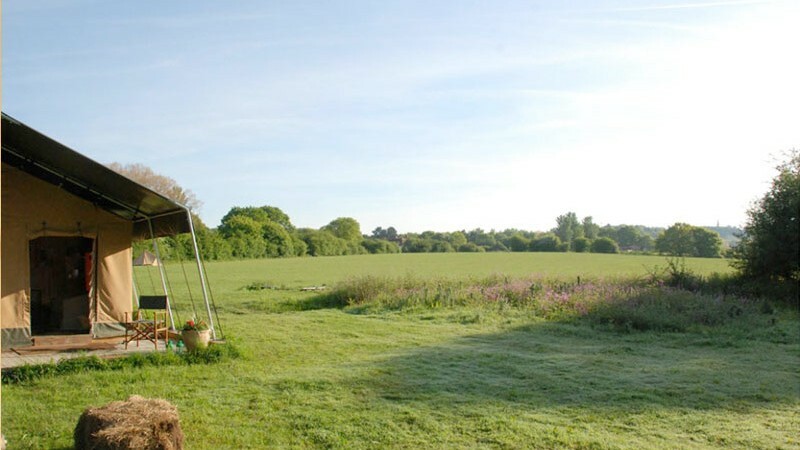 Have you always wanted to run a glamping site? How did you get interested in it? My background is in the holiday industry and I worked for some of the biggest names in the business for 20 years, mainly in a data analysis role. Part of this was to identify trends in the data and while doing this I noticed a shift in the demographic profile of the bookers and a definite change in the booking patterns towards shorter, late booking breaks. When I investigated further I identified a demand for up market UK based holidays with the facilities but without the crowds. I researched the European holiday market and found the demand for what were then called ready tents was very high and getting higher. 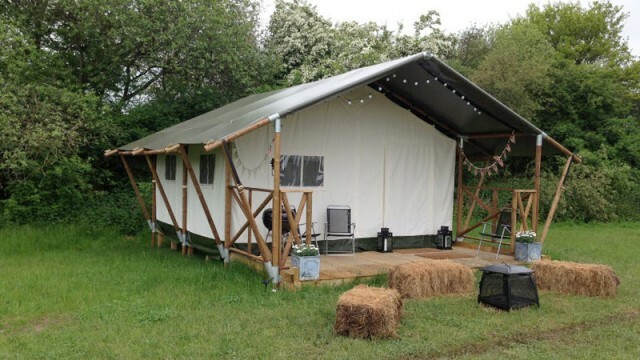 These tents were poor quality and did not meet the obvious requirements of a holiday park, so we worked on a design for a steel frame safari tent which we eventually managed to get built. We then established two businesses in 2011, one to sell the tents and the second to offer glamping, and the rest, as they say, is history. Its something we both really enjoy doing, and getting positive feedback from our clients is amazing! What made you pick the location for your glamping site? 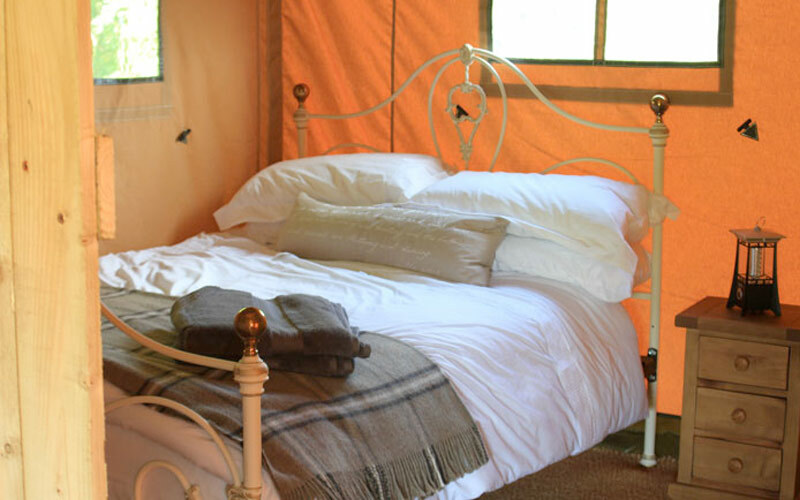 We provide glamping on our own farm in a remote field next to our private fishing lake. The area is perfect for exploring a wealth of historical sites, attractions and of course for just kicking back and doing absolutely nothing. Do you get a wide range of different people from different walks of life or are there certain types of guests who come to stay at your site? We get two main groups, romantic couples in the 25 – 45 age range especially on Fridays after a busy week working in London and families in the 30 – 45 age bracket of the 2 + 2 variety. Cameron loves other young children coming glamping with us and he is always keen to meet and entertain them, letting them ride his pony and so we get quite a lot of repeat business from families. We have had some young groups but we are not really big enough for hen parties. When guests stay, do they usually cook on site or do you find a lot like to go exploring and eat out at local places? It’s a mixture of both. We provide hot meals for late arrivals on Fridays if they request it, some just bring the contents of their kitchen and cook al weekend and some just walk to the local pub for beer and grub. We also provide a BBQ for each of the tents. We are lucky we have an amazing local pub “The Bush, Blackbird and Thrush” which serves beer from the keg and really good food. If there was one activity to participate in, landmark, or place of interest that you would recommend guests visit while staying at your site, what would it be and why? Leeds castle has a bit of everything and well worth a visit for families and couples alike. The castle is beautiful and has several adventure playgrounds for the kids, a beautiful maze and some superb history. 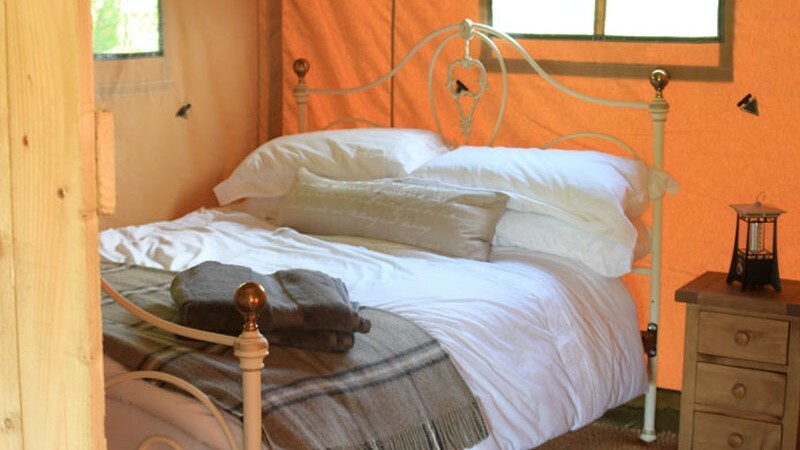 What do you think sets your glamping site apart from others? Every guest has the run of the whole farm, so the space available is massive which really appeals to the townie glampers. The most popular pastime is collect wood and burning it on the open fire in the front of each tent. With no one saying you can’t do that, the freedom is almost intoxicating. What has been the most memorable moment that has happened on your glamping site? One booking was for the whole site and they even brought some extra tents of their own. There were 30 people celebrating a lady’s 40th. Husband had arranged a few surprises during the weekend including a tea of sky divers who landed at the tents with a bottle of champagne and a hot air balloon that took off from the tents across the Kent countryside. Do you provide any services/entertainment/activities onsite or elsewhere for your guests? We have links with a mobile spa company and do offer their services for special occasions, but our main aim is to leave the clients alone to enjoy the freedom of their stay. What plans (if any) do you have for your glamping site in the future? We are currently constructing a third safari tent, our largest so far. This is being kitted out with very high quality luxurious fittings and will feature a log burning stove in each bedroom, internal shower and toilet facilities and a hot tub on the veranda. Next season we will be installing better showers and toilets for each tent. Elizabeth Gurney on Competition: Win the ultimate backpack! lynn mitchell on Competition: Win the ultimate backpack! Jan Anne Mann on Competition: Win the ultimate backpack!